This will be a very practical vehicle once the ice caps fully melt. 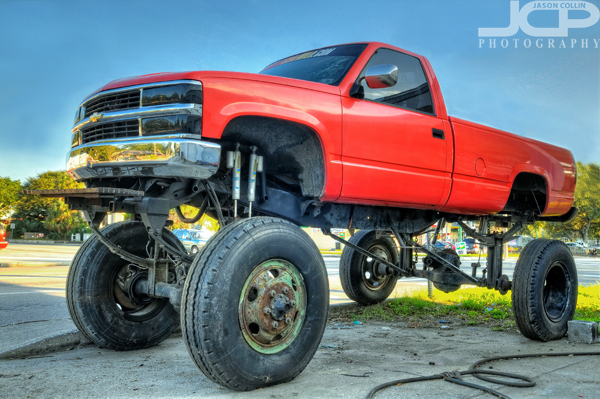 A few months ago I first drove past a pair of jacked-up monster 4x4 trucks. I thought it was pretty unusual for such vehicles to be seemingly left for naught at a rundown looking garage. I felt bad for them in a way. My business the past few months took me past them maybe a dozen more times, and I said each time I passed them, "I've got to photograph them when I get a chance." Finally today I had the chance. 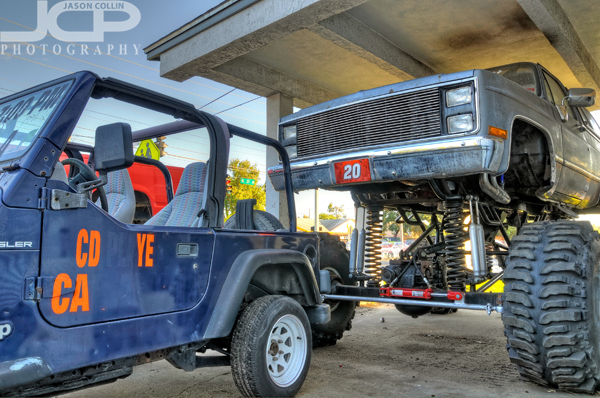 This monster 4x4 could be the most intimidating tailgater on the road! It was fun to stand next to these sky high trucks and think about what it would be like to drive one, heck what it would be like to just try and get into the driver's seat! 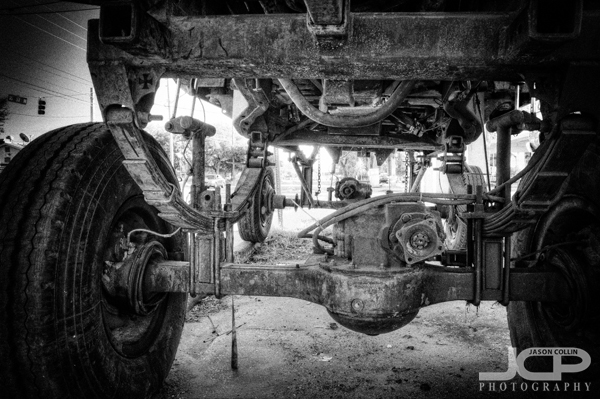 Two guys walked by me while I was making these photographs and we chatted a bit about the trucks. They said the trucks were definitely weekend only vehicles, and not something you want to take your girl out in! The intricacies of the lift kit. As a photographer, it always feels good to check something off your personal list of things to photograph, and I highly recommend making and having a list of things in your neighborhood you want to photograph. Now the next time when I drive past these trucks on 16th Avenue they will feel like friends since I made the time to introduce myself. I think they liked having someone pay attention to them again.